A single point gave the title to the trio. The first big Apex Legends tournament is now over. The North-American Twitch Rivals Apex Legends Challenge champions are Tyler “Ninja” Blevins, Richard “KingRichard” Nelson, and Coby “dizzy” Meadows. They played the tournament under the team name of King’s Canyon. The trio placed first by scoring 420 points total, just a single point ahead of the Reid’s Money Team trio of Chocotaco, VSNZ, and Huskerrs. King’s Canyon got 13 wins and 355 kills to reach their tournament-winning score, with Ninja, KingRichard, and the rising star dizzy earning $8,000 for the title. It doesn’t get any closer! Your #TwitchRivals Apex Legends Challenge NA Champions are Kings Canyon! Congrats @KingRichard @Ninja & @dizzfila!🏆 Well played to all the NA squads! It was a tough tournament, even if it was played on public matches (there’s no custom matchmaking system in Apex Legends). Ninja, KingRichard, and dizzy had to overcome a mountain glitch that made Ninja unable to move midway through a match. After the storm eventually killed him, his teammates got his banner back and respawned him to win that match. King’s Canyon’s great performance was also thanks to dizzy. He dominated the event with the highest kill count—which perhaps could have been expected considering he holds the world record for most solo kills in a single Apex Legends match, with 33. That means he killed more than half of the players in a single match. Ninja has also shown he’s in good shape. Though he hasn’t found much success in recent Fortnite tournaments he competed in, this is another title this streamer and culture personality gets while playing a game that’s experimenting with competitive formats. He also won the first official tournaments of H1Z1, Playerunknown’s Battlegrounds, and Fortnite. 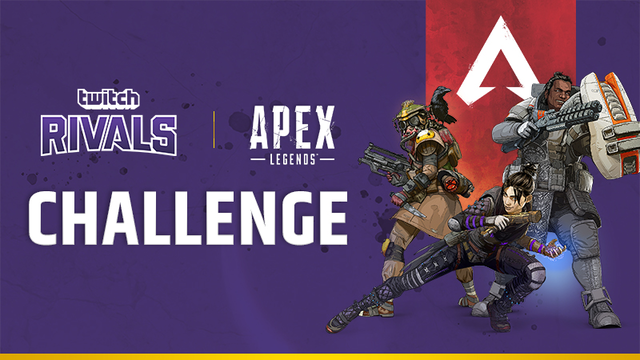 A second Twitch Rivals Apex Legends Challenge is set to take place on Feb. 19 and 20. The event will once again feature Twitch streamers who will compete against each other in public games to find out who the best Apex Legends squads are so far.